Where I’m At Home in the World – seek. follow. love. If you haven’t heard about Tsh Oxenreider’s new book At Home in the World, it’s time to catch up. Tsh writes about her around the world trip with her husband and three kids, each chapter describing a new place, a new culture, a new potential place to feel at home, a new place that IS home to so many others. What I love most about this book — and Tsh’s travel/home philosophy, in general — is that she balances her wanderlust with a spirit of loving the place in which you live. It’s a balancing act I’m very familiar with. Both/and, right? We don’t have to choose travel or home. We can love both. But I also love to travel and explore and adventure, especially with my husband. My wanderlust was kindled in France during a couple trips in college, including a four month study abroad in Strasbourg near the German border. Outside of my red split-level, and maybe my parents’ house, there is no where I feel more at home in the world than that beautiful Alsatian city, with its half-timbered homes, cobbled streets, and amazing single-spire cathedral. Chad and I have been back to Strasbourg twice since our months of studying there in college, and both times felt like coming home. Stepping out of the train station, I can feel it — the way my whole being sighs with relief to be back. Tears well up in my eyes, while the rest of me settles in to the rhythms of the city. Home. Even looking at photos of the city make me ache to go back. Memories flood me: walking past the beautiful grassy expanses of Parc de l’Orangerie across from the Palace of Europe, taking a short-cut to the university through the botanical gardens, walking narrow, cobbled streets lined with boulangeries and patisseries — the most impressive perched on the corner near our study abroad office, windows full of the most beautiful pastries and glossy chocolate-covered treats. I know where to get the best croissant, the best sandwich, and the best glass of local beer. If it’s Christmas, well … there is nothing like Christmas in Strasbourg. It’s literally called the Capital of Christmas. The entire city transforms, with lights and markets and decorations and a Christmas tree nearing 100 feet. The smell of mulled wine wafts through the streets, and everything glitters and glows. Around every corner is another shop or house decked out with garlands and twinkling lights and fake snow. There is no restraint at Christmas in Strasbourg, and it’s impossible not to get swept up in the fervor. I could spend hours just walking through the market stalls, letting the spirit of the Christmas season fill me with hope and joy and light. On our most recent trip to Strasbourg — during the Christmas season, of course — we also ventured out to the countryside to explore the wines of Alsace. Each little village dotting the vine-filled landscape boasted of tasting rooms and caves. We visited wineries, sampling delicious Rieslings, beautiful golden Gewurztraminers, and a lovely Crémant d’Alsace. In making wine a part of life, we relished that way we could integrate our love of Strasbourg and Alsatian culture with Chad’s business and passion for wine. Each trip, in fact, brings out a new facet of this charming French region that makes us fall even more in love and makes us feel even more at home. The months we lived in Strasbourg in college were a coming-of-age of sorts. I grew up so much. I made the most incredible friends. Chad and I started the beginning of a wonderful life together. That’s what makes our connection with the city so deeply rooted. And it was the beginning of our travels together, the first place we practiced making a home together. There are so many places in the world, and they are all home to someone. There’s something deeply beautiful about visiting and experiencing a new part of the world, discovering how its people make their lives there, and tasting and seeing what makes it special. And there’s also something deeply beautiful about coming home, about finding rest and comfort, about building a life in the place you live. I’m so glad I’ve done both. 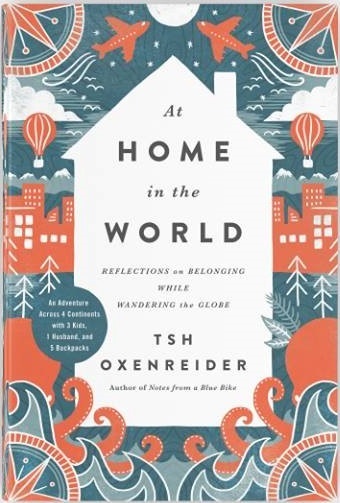 Tsh Oxenreider’s book At Home in the World is available now. Don’t miss it! And visit her website for more stories about favorite cities and living a simple life. I loved this. I really enjoyed Tsh’s book and am so grateful you gifted it to me. As potential opportunities arise to reside elsewhere, my heart aches thinking about the possibility of stepping away from this place. This place where I’ve resisted rooting. I’ve struggled with calling NJ home, but it is. I love the community I have. Home is community. We can find that anywhere, yes, but once you have it established, you enjoy coming back to it. Wanderlust exists and traveling around the world opens our hearts and minds to people of all different backgrounds, growing us in the process. It is a delicate balance. I’ve not yet achieved it fully, that I think. Maybe I have, but still have to surrender the sin of ingratitude. So well written that I want to visit again!